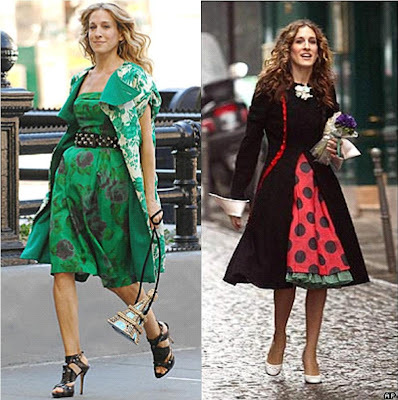 Here's another way to wear prom dresses with hijab, Carrie Bradshaw style! In the first picture, Carrie wears a floral print dress with a sleeveless floral jacket on top. I found these matching dresses and jackets at Boden. Just add navy or white smart trousers, heels, matching hijab and quirky handbag. Silk linen coat £110; silk linen dress £95. Or you could wear the dress under a plain black or white trench coat, just like in the second picture. 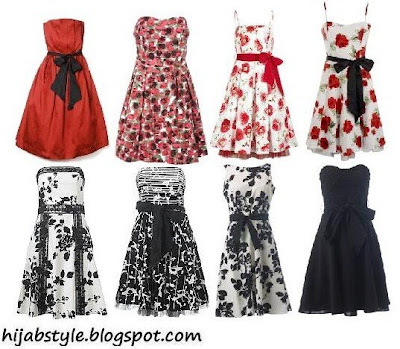 I found plenty more printed and plain prom dresses. Which hijabi version do you prefer? Primark £16; Warehouse £70; Oli £65; Debenhams £55; New Look £30; New Look £30; Dorothy Perkins £20; Dorothy Perkins £20. what are your thoughts on the egypt visit on women in black? Ah I'm afraid you'll have to wait until tomorrow for my take on it. It'll be a good one though inshallah. ooooh. I like this post! I look forward to your bridal post. Ughhh, some woman is slandering me because I tried to defend hijab. Alix, yeah I saw... just ignore the haters! Awa, I know they're gorgeous, and there are plenty more but I thought I should stop at 8!